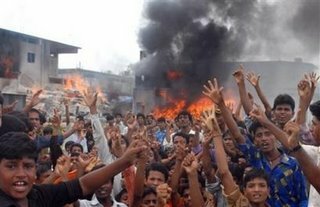 Since February 2008, riots and protests concerning rising food prices or food shortages have been reported in Bangladesh, Bolivia, Cameroon, Egypt, El Salvador, Haiti, Indonesia, Ivory Coast, Mauritania, Mozambique, Philippines Senegal, Uzbekistan, and Yemen. Poorer countries like Bangladesh, Indonesia and in which 60-70 percent of the income is spent on food are particularly hard hit by soaring food prices. In China, the price of pork, their staple diet, has risen by more than 60 percent in the last 12 months. In Vietnam, consumer prices rose by about 17 percent (YoY) in the first quarter of 2008. Up to 20,000 workers at a Vietnamese shoe factory opted for a a two-day strike last week “because of the increase in prices which has hit people hard recently,” according to union official Nguyen Thi Dung. In Singapore, one of Asia’s wealthiest countries, ten people were arrested by police last month for holding a rally, without a permit, to protest rising living costs. Rising food (and fuel) prices have triggered protests also in India, Malaysia and Pakistan causing seismic shifts in political and social policies.